This article is a copy of "Cataclysm: The Story So Far...", an official article by Blizzard Entertainment. 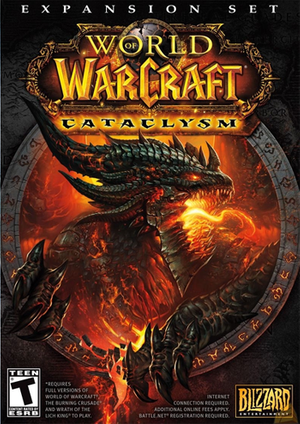 It presented the story implemented in the third expansion, World of Warcraft: Cataclysm. The Lich King's reign of terror was over. As if to affirm that a bright future would soon dawn on Azeroth, other joyful events occurred across the world. Archdruid Malfurion Stormragewas at last freed from his imprisonment by the shadowy Emerald Nightmare through the efforts of his love, High Priestess Tyrande Whisperwind, and her allies. Elsewhere, after years in exile, the highly intelligent gnomes and the fearless Darkspear trolls made gains toward reclaiming their respective homes in Gnomeregan and on the Echo Isles. In a sudden upheaval eclipsing the world's recent elemental unrest, Azeroth shattered. Violent quakes tore through the earth. Mountains of fire and magma burst from the ground. Colossal tidal waves obliterated coastlines and caused widespread flooding. The Cataclysm had begun. As the world's races struggled for survival in the wake of the Cataclysm, details came to light concerning what—or who—had caused the disaster. Prior to the upheaval, the Fury of Earth had cryptically told Thrall that Azeroth's instability had been caused by something good that had turned unnatural. Something that wished to inflict pain and suffering on the entire world. The warning was in reference to an ancient being once known as Neltharion the Earth-Warder. Long ago, this Aspect of the black dragonflight had been granted dominion over Azeroth's earthly expanses by the benevolent titans. Yet the incessant whisperings of the Old Gods had gradually driven Neltharion insane and caused him to abandon his sacred charge. He had later revealed his treachery during the War of the Ancients by turning an immensely powerful artifact — the Dragon Soul — against his allies, annihilating nearly all of the blue dragonflight. Forever after, Neltharion would answer to a new name: Deathwing. Deathwing's murderous aim had become the subjugation of the other dragonflights, a goal left unfulfilled decades ago when he was chased into hiding by the Dragon AspectsAlexstrasza, Ysera, Nozdormu, and Malygos. In Deathwing's absence, agents of the black dragonflight continued one of his darkest schemes: creating a more powerful breed of dragon. The most promising of these vile experiments resulted in twilight dragons, malefic creatures that first appeared in the cursed and abandoned dwarven city of Grim Batol, and later within the hallowed Chamber of the Aspects. During many of these developments, Deathwing remained hidden. Rumors regarding his death circulated, leading to the assumption that his malevolent influence on Azeroth was at an end. Such was not the case. 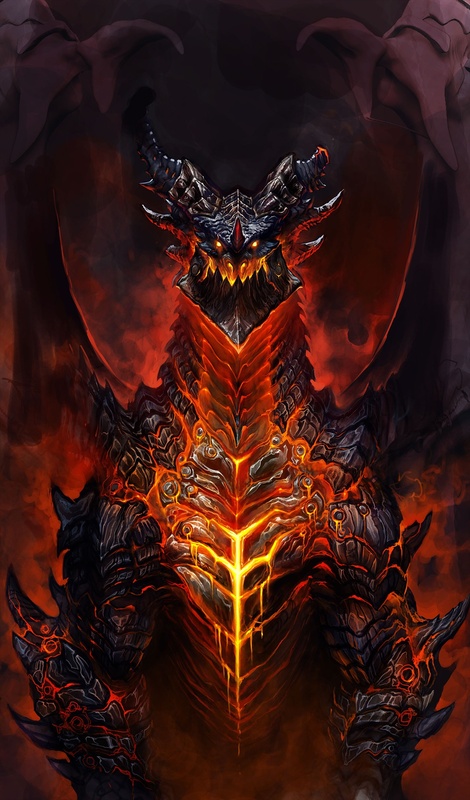 In Deepholm, the domain of earth within the Elemental Plane, Deathwing nourished his hatred of Azeroth's inhabitants, awaiting his moment to burst forth from his lair and reforge the world in flame. That fateful day—the Cataclysm—arrived shortly after Thrall's return from Outland. Deathwing's violent return did much more than sunder the lands of Azeroth; it also ruptured the boundaries of the Elemental Plane. In the aftermath, chaotic elementals emerged into the world from within the Abyssal Maw, Deepholm, the Firelands, and the Skywall. Working with Deathwing, the Twilight's Hammer cult and its twisted leader, Cho'gall, established footholds across the world with the aid of twilight dragons and enslaved elementals. Thus far, many of Azeroth's defenders have devoted themselves to combating the cult and allaying the elemental forces threatening to tear the world apart. Chief among these champions are the shaman of the Earthen Ring, including Thrall, Nobundo, and Muln Earthfury. Other Horde and Alliance heroes have also risen to the challenge, but their focus has been split due to skirmishes between the two factions. Amid the turmoil, two other beleaguered groups are striving to overcome their own hurdles. The human kingdom of Gilneas, walled off from the rest of the world for years, has come under assault by Queen Sylvanas's Forsaken. Aside from the undead, the kingdom is assailed by a debilitating curse that transforms its victims into feral wolf-beasts known as worgen. Meanwhile, a volcanic eruption on the tropical Isle of Kezan has ousted the Bilgewater Cartel and other goblins from their homes. Trade Prince Gallywix has capitalized on this moment of panic and swindled his fellow goblins out of their life savings—and their freedom—in exchange for transport off of Kezan. Much like Gilneas and the Bilgewater Cartel, other kingdoms and factions the world over face their own trials, from internal political strife to the reappearance of ancient foes. Yet there is one inescapable truth that they all share: if Deathwing and his nihilistic servants are left unopposed, the Cataclysm will pale in comparison to the chaos that lies ahead for Azeroth.